For our Scottish themed book group meeting, I made a variety of different Scottish foods, more of which I will share here shortly. 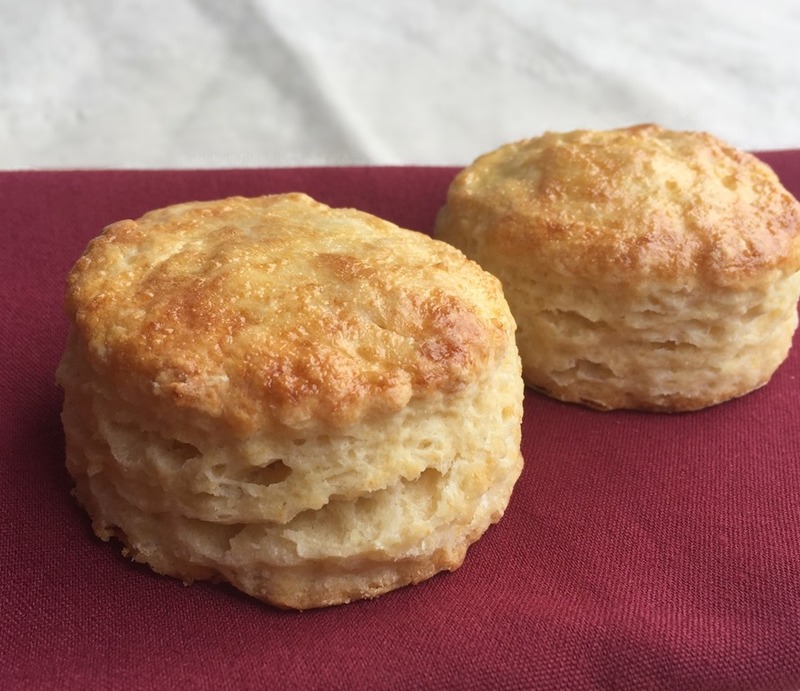 Scottish (or English) scones are a light, tender biscuit that can be adapted to many different flavors. Scones can be a savory food or a dessert. Or breakfast, or a snack, or just about anything you want them to be. These vanilla scones, while not sweet themselves, are more of a dessert food. Especially if you serve them with Clotted Cream (or whipped cream) and jam. They also make a great base for Strawberry Shortcake. I served them with a Homemade Clotted Cream (made in an Instant Pot) and Homemade Red Raspberry Jam and Cinnamon Pear Jam. Scones can also easily be frozen either before or after baking. To freeze before baking: Prepare scone dough. Cut out scones and place on a baking sheet lined with foil. DO NOT brush with egg wash. Freeze until firm. Place into Ziploc bag or freezer container and store in freezer. Place frozen scones on a baking sheet lined with parchment paper or silicone mat. Let sit at room temperature for 30 minutes. Brush tops of scones with egg wash. Bake at 400°F for 16-18 minutes. To freeze after baking: Prepare and bake scones. Cool completely and place on a baking sheet lined with foil. Freeze until firm. Place into Ziploc bag or freezer container and store in freezer. Place frozen scones on a baking sheet lined with parchment paper or silicone mat. Let sit at room temperature for 30 minutes. Bake at 300°F for 10-12 minutes. Preheat oven to 400°F. Line a baking sheet with parchment paper or silicone mat. In a separate bowl or Pyrex measuring cup, mix together buttermilk, 2 Tbs cream, egg, vanilla extract, and vanilla bean seeds. In a small bowl, mix together egg wash and set aside. Make a well in the dry ingredients and pour in buttermilk mixture. Use a rubber spoon to gently mix, until most of the dry ingredients are mixed in. Turn dough out onto a flour coated surface and pat and/or roll dough to about 3/4” thick. Use a scone or biscuit cutter to cut into rounds. Place on prepared baking sheet. Gently reroll scraps to make additional scones. Brush tops of scones with egg wash. Bake for 15-18 minutes, or until golden brown. 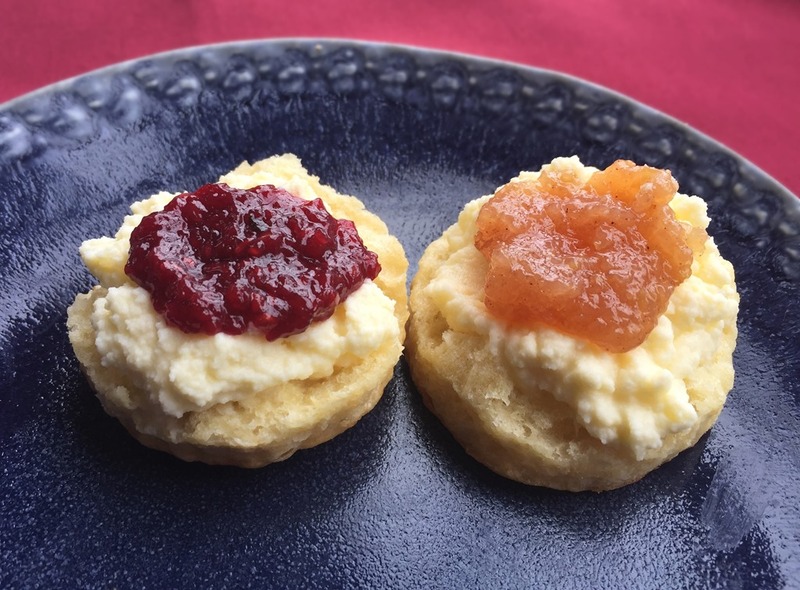 Serve scones with clotted cream and jam. **NOTE: To easily cut butter into dry mixture, freeze one stick of butter for 30 minutes. Fold back the paper wrapper to the 6Tbs mark and use the coarse blades of a cheese grater to grate the butter directly into the dry ingredients. Use a rubber spatula to fold butter shreds into mixture. Scones can be frozen either before or after baking. Canning is generally a summer sport. Summer harvests mean you usually have to spend the hottest days of the year blanching fruit, stirring boiling pots, and having steam from a boiling water bath canner fill the kitchen with heat and humidity. Do you ever wish that you could do your canning in the middle of the winter, when a little extra heat and humidity would be most welcome? I can’t get rid of all of that summer canning, but here is one recipe that is perfect to make on a cold, snowy day. And it will make your house smell truly heavenly. Pears make a wonderful jam and are an easy fruit to work with any time of year. Most varieties have thin skins, so you don’t need to peel them, and you can chop them quickly in a food processor. This jam is also flavored with cinnamon and vanilla, which makes it easy and amazingly delicious! I use a combination of sugar and stevia to make a lower sugar jam that doesn’t compromise on flavor. You could add additional sugar if you don’t want to use the stevia. And it’s not just for toast: try stirring it into some plain yogurt or spreading on some homemade pancakes for a delicious breakfast or snack. Prepare equipment: sterilize half-pint jars, lids, and canning equipment (ladle and funnel). Prepare a boiling water bath. Wash and core the pears, but do not peel. Finely chop or coarsely mash to yield 7 cups fruit. (I use a food processor to finely chop/mash the pears). Stir in lemon juice. 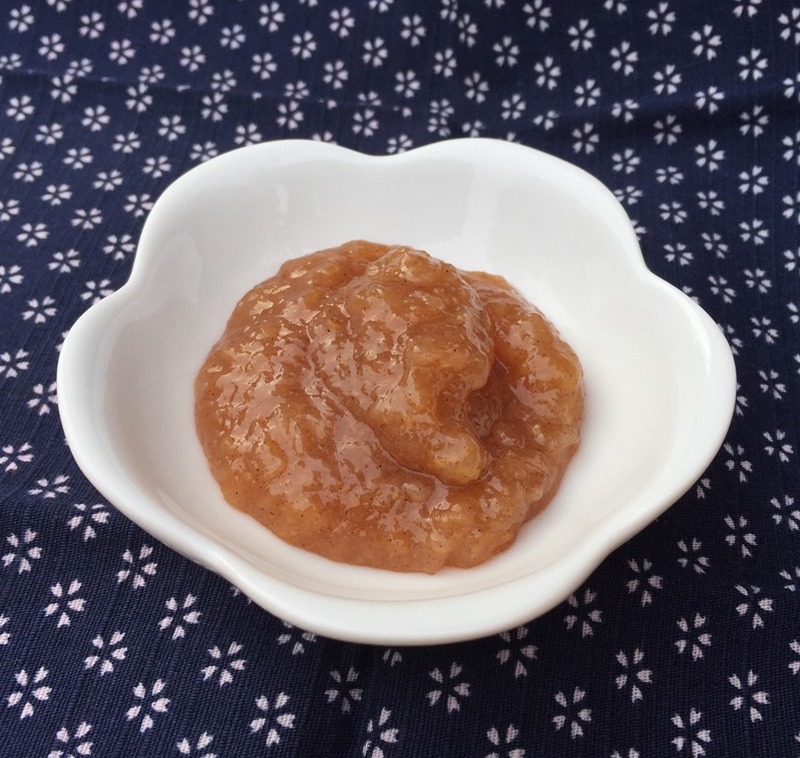 In a small bowl, combine ¼ cup of the sugar with the box of pectin. Mix well and set aside. In a large pot, combine the chopped pears, remaining 2 cups sugar, stevia, cinnamon and vanilla beans (both seeds and pods), if using. Bring to a full rolling boil over medium-high heat. Reduce heat to medium (maintain a low but continuous boil), and boil for 10 minutes, stirring occasionally. Stir in sugar/pectin mixture and vanilla extract, if using. Return jam to a full boil and boil for an additional 5 minutes. Remove vanilla bean pods and discard. Remove jam from heat and let sit for 3-4 minutes. Stir jam. Ladle hot jam into prepared jars. Wipe top edges of jars with a damp cloth. Add lids and rings. Place in a boiling bath canner and when pot has returned to a full boil, process jars for 10 minutes. Remove jars from canner and place on a towel on kitchen counter. Let sit for 24 hours. Check seals before placing on pantry shelf. Stevia brands can vary in sweetness. 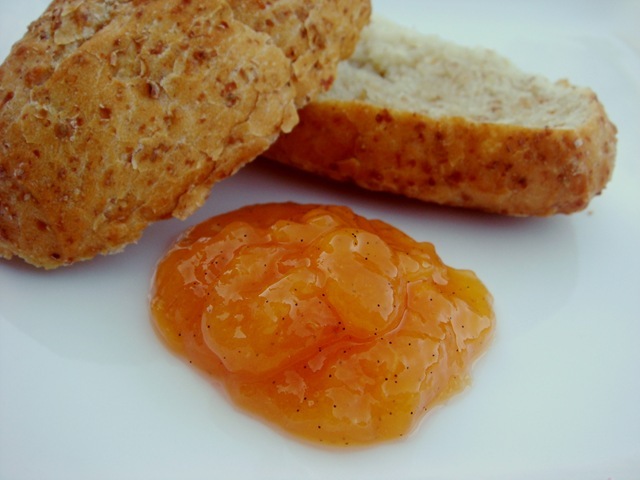 Taste jam before adding pectin and adjust sugar to taste. Letting the jam sit for a few minutes before ladling into jars helps to reduce foam and keep the fruit chunks from settling to the bottom of the jars. The final two jams that we made last week were Peach Butter (recipe found HERE) and this Sour Cherry Vanilla Jam. The vanilla flavor was not as pronounced as in the Peach Vanilla Jam, but the jam was still really good. Slightly tart from the sour cherries and nice and thick. To get more of the vanilla flavor next time, I am going to soak the chopped cherries with the sugar and vanilla bean overnight before cooking the jam. Mix cherries, juice or water, 1 1/4 cups sugar, and stevia in a large bowl or saucepan. Split vanilla bean in half lengthwise and using the tip of a knife, scrape the seeds into the cherry mixture. Stir vanilla bean pod into the cherries. Let sit for 2-3 hours to overnight (strengthens the vanilla flavor in the jam). Mix pectin with 1/4 cup sugar. Stir into cherry mixture. Bring to a hard boil (boiling doesn’t stop when stirred) over medium-high heat. Cook, stirring constantly, for 5 minutes. Remove from heat. Remove vanilla bean. Ladle into jars, leaving 1/8” headspace. Wipe rims of jars. Place lids on jars. Place jars in a boiling bath canner or steam canner. Return water to a gentle boil. Process 10 minutes. Cool on a towel on kitchen counter for 24 hours. Check seal. **NOTE: The cherries I used were from a 10 lb bucket of pre-pitted sour cherries. I added 1 cup of the juice from the bottom of the bucket to the jam. If you are pitting your own cherries, you may not need to add this much additional liquid. Of the five jams that we made last week (maybe of all the jams I have ever made), this is my very favorite. Fresh ripe peaches and flecks of vanilla bean. And low in sugar. What could be better. 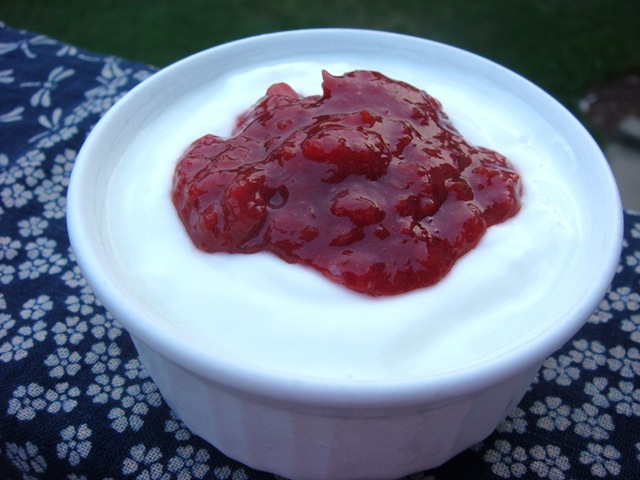 Try it mixed into some homemade yogurt, or on top of ice cream. It is still too early in the season here for freestone peaches, but there are some good deals at the farmers market on some luscious, ripe non-freestone varieties. And for jam, these are perfect! 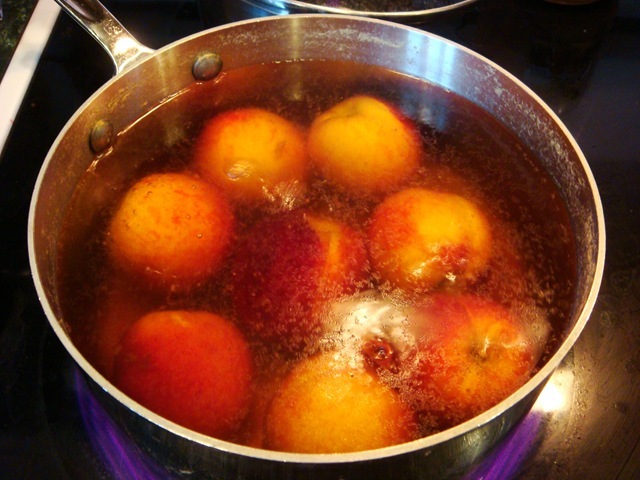 To quickly and easily remove the peach skin, blanch the peaches in simmering water for 15-30 seconds, then transfer to an ice water bath. 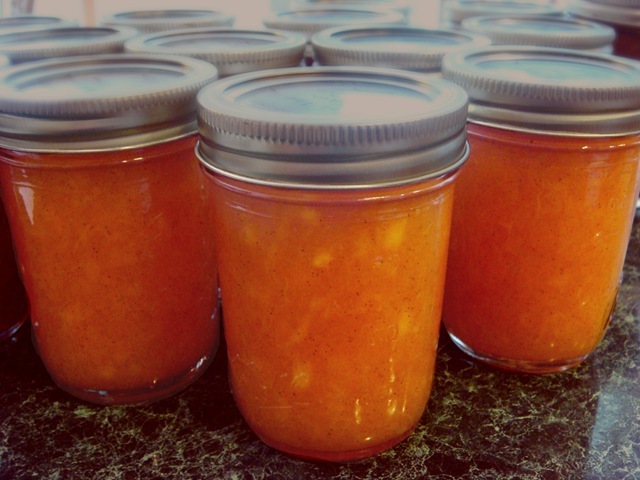 When making jam, the easiest way to crush your peaches, especially non-freestone varieties, is to take the whole peeled peach in your hand (over a large bowl) and squeeze. If your peaches are ripe, which they should be for a good jam, the peach flesh will be crushed through your fingers, leaving you with just the pit in your hand. Kids love this job! To get as much vanilla flavor in this jam as I could without overcooking the peaches, I combined the crushed peaches with some lemon juice, 1 cup sugar and 1/2 tsp stevia in a large bowl. Then I added the vanilla bean (cut the bean in half lengthwise, then use the tip of a knife to scrape all of the seeds into the bowl with the fruit); stir in both the seeds and the vanilla bean halves. Let peach mixture sit for 2-3 hours, or overnight (in the refrigerator). 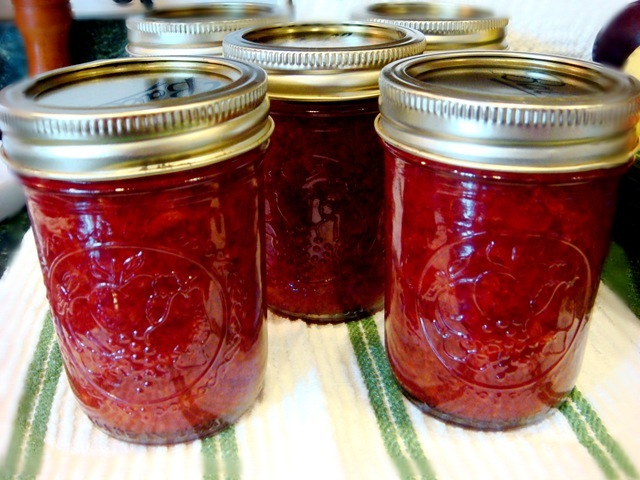 Leave the vanilla bean in while cooking the jam, removing it just before filling your jars. I love vanilla bean flecks! 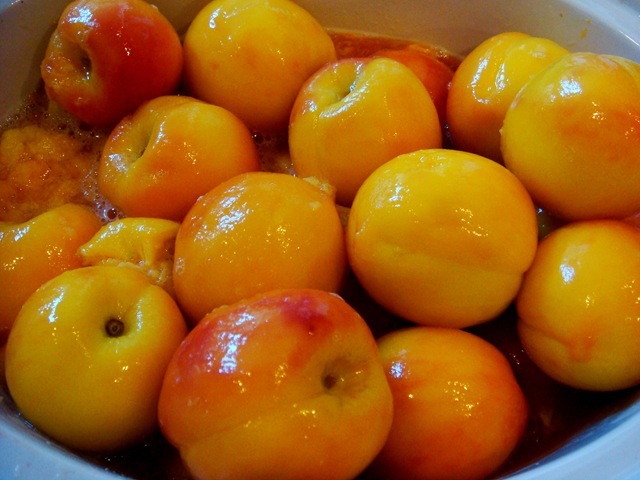 Combine peaches, 1 cup sugar, stevia and lemon juice in a large saucepan or bowl. Split vanilla in half lengthwise. Scrape seeds into bowl with peaches. Stir in vanilla bean. Let sit for 2-3 hours or overnight (refrigerate if leaving overnight). Mix pectin with 1/4 cup sugar. Stir into peach mixture. Bring to a hard boil (boiling doesn’t stop when stirred) over medium-high heat. Cook, stirring constantly, for 3-4 minutes. Remove from heat. Remove vanilla bean.